Many people are searching for natural treatment options for Multiple Sclerosis (MS). There is an abundance of good research and evidence, that a combination of dietary and lifestyle changes can enable those with MS to live long and fruitful lives. Multiple Sclerosis (MS) is a chronic inflammatory disease affecting your central nervous system, (CNS). Multiple plaques, (or lesions), develop in the white matter of your CNS, causing destruction of the fibres surrounding the nerve cells, called myelin sheaths. Scarring can then develop, which impairs transmission of the nerve impulses. This can interfere with your motor, sensory and even cognitive functions, leading to problems with eyesight, walking, and other bodily functions controlled by the CNS. MS is classified as an autoimmune condition, although there are some schools of thought which believe that it is also neuro-degenerative in nature. Relapsing-Remitting MS (RRMS). This is the most common form of multiple sclerosis. About 85% of people with MS are initially diagnosed with RRMS. People with RRMS have temporary periods called relapses, flare-ups or exacerbations, when new symptoms appear. Secondary-Progressive MS (SPMS). In SPMS, symptoms worsen more steadily over time, with or without the occurrence of relapses and remissions. Most people who are diagnosed with RRMS will transition to SPMS at some point. Primary-Progressive MS (PPMS). This type of MS is not very common, occurring in about 10% of people with MS. PPMS is characterized by slowly worsening symptoms from the beginning, with no relapses or remissions. As is the case with most autoimmune conditions, the exact cause of MS remains elusive to modern medicine. It appears to be a combination of genetic and environmental factors. MS is thought to begin with an infectious agent (mycobacteria/virus/parasite) in childhood that primes the immune system for an autoimmune attack against myelin components in early adulthood. Genetics may also play a role, as does Vitamin D deficiency. But what is clear is that multiple chronic infections appear frequently in MS sufferers, as the below graph demonstrates. The below list includes other infections suspected of triggering MS.
Vitamin D insufficiency and deficiency, has been found by researchers to play a major role in the both the risk of getting multiple sclerosis, and also in the relapse rate for those suffering from the disease. Vitamin D plays a crucial role in regulating the immune system through its effects on types of immune cells, called T-Reg Cells (TR). By doing this it helps to redirect an over-active immune response, to 'turn the volume down'. The two main arms of the immune response, Th1 and Th2, need to be in balance in order for your immune system to function properly. 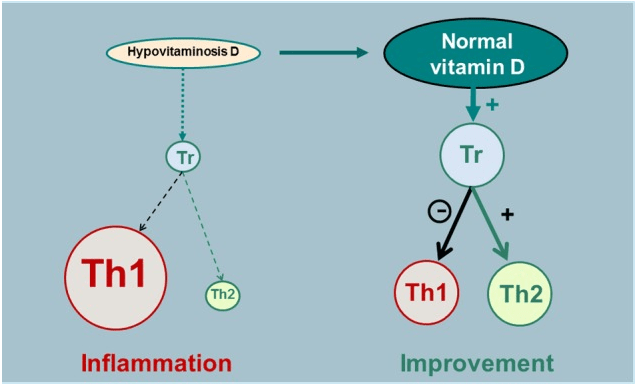 If one is more dominant than the other, (such as too much Th1), due to a lack of Vitamin D, (hypovitaminosis D), problems can occur, including autoimmune conditions like MS.
Levels of Vitamin D decline dramatically in patients with MS as the disease progresses, as the below table shows. You can see that 75 is considered the "healthy" level in the normal population, but as we know, the vast majority of us don't have enough Vitamin D , (less than 75). 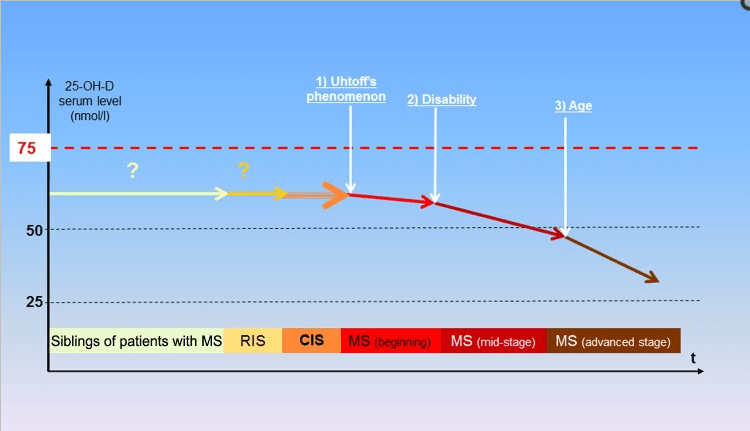 Schematic representation of the evolution of Vitamin D levels according to multiple sclerosis stage. Will taking a Vitamin D Supplement help stop Multiple Sclerosis? The short answer to this is yes, to a point. The studies tell us that you can reduce the relapse rate of MS by increasing your blood levels of Vitamin D, up to 110. Anything above this, does not seem to show a benefit, as the below graph demonstrates. Zinc and Vitamin D are two of the most crucial nutrients your body needs to support your immune system. Geelong Nutritionist Adrian Stone, from Living Holistic Health, explains this further in this short video. As with all autoimmune diseases, plenty can be done to help using naturopathic and nutritional medicine. Some of the options may be limited, especially if you are taking immune suppressing medication. But there is much that can be achieved through using specific herbs, nutrients and diets to assist. The core principles of our approach are as follows. 1. Reduce microbial load - certain herbs such as phellodendron and black walnut, and essential oils like thyme and oregano, can be very effective at reducing the amount of infectious microbes common in MS sufferers. And the advantage that these natural antimicrobials have over antibiotics, is that bad bugs find it hard to build up resistance to them, which they can with frequent antibiotic use. 2. Control inflammation - anti-inflammatory herbs like tumeric, boswellia, and hops can help to reduce the inflammation of an active autoimmune attack. Crucial to this process also is to support tissue repair and integrity, to reduce the lesion scarring common in MS. Highly purified Omega 3 fatty acids may also assist in this. 3. Support mitochondria - your mitochondria are the 'powerhouses' of your cellular health, responsible for giving you energy, enhancing your mood and supporting your immune system. Therefore protecting them is a priority in MS sufferers. This can be done with certain nutrients, such as phophatidylserine, tocotrienols, CoQ10 and resveratrol at the correct doses. 4. Stimulate immunity - direct immune stimulation can be contraindicated in MS sufferers who are on immune suppressing medication. However, immune system support is still crucial for these people, as these drugs will lower your immune system generally, making you more susceptible to getting infections. Also, if the underlying chronic infections which are driving your MS symptoms have not been identified and dealt with in the first place, these drugs will bring these infections to the surface, which may cause you to become very sick. However through using nutrients such as Zinc and Vitamin C, in the correct forms and doses, your body can be supported to help your weakened immune system fight off the infections. 5. Support immune regulation - as we have shown above, supporting your T-Reg cells and reducing the level of Th1 activity, will help to balance your immune response and reduce your inflammation. Achieving and maintaining an adequate level of Vitamin D is integral to this process. In addition, certain strains of probiotics have been shown to help support immune balance also. 6. Support digestion and gut health - your gut houses 70-80% of your immune system. Therefore if you have an autoimmune condition, such as multiple sclerosis, looking after you gut health needs to be a high priority. This is where naturopathic and nutritional medicine can be highly beneficial, as knowing how to support gut health is a key strength of naturopathy. How this is to be done will vary from person to person, but our practitioners are highly skilled at identifying any imbalances and correcting them. The link between Multiple Sclerosis (MS) and our gut health is continuing to gain prominence, as more research continues to emerge. 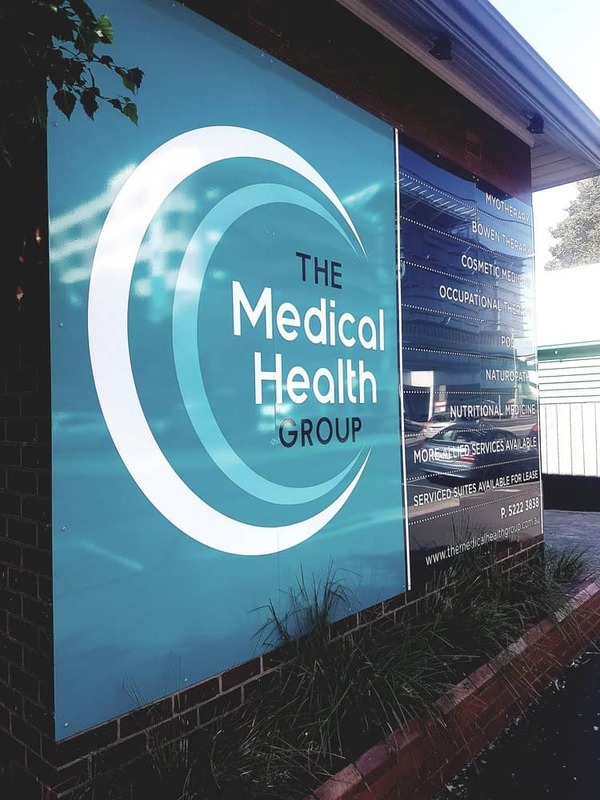 Geelong Nutritionist Adrian Stone, from Living Holistic Health, explains more on the link between this autoimmune disease, and our digestive system. There has been research conducted, (as far back as 1950! ), examining the relationship between diet and MS. Diet is fundamental in the management of multiple sclerosis. Which type of diet you need though, will vary from person to person. Often those people who seek treatment from their specialist for an autoimmune condition, are not given any guidance as to the role of diet. Eating and/or avoiding certain foods are critical in helping to manage any autoimmune disease. Geelong Nutritionist Adrian Stone from Living Holistic Health, explains more about the role of diet and autoimmune diseases in this video. We utilise the evidence based dietary approaches below, depending on what we feel is most appropriate for the patient, on a case by case basis. Each of these diets have their advantages and disadvantages, which is why it is important to have some professional advice before you start them. However, what all of these diets have in common is very powerful. And that is that they give you, the MS sufferer, back the control of your condition and your health destiny. Many MS patients feel overwhelmed by their illness, and will follow the advice of the GP's and neurologists who will frequently recommended only drug based therapy. What you need to understand is that you can make a tremendous positive impact on your health, by altering your diet and lifestyle, rather than just relying on drugs. Back in 1950, Dr. Roy Swank enrolled 144 patients into a study in Montreal, Canada. His study evaluated the amount of saturated fats in the diet of MS patients. He found an improved response in those patients who went on his very low saturated fat diet. In fact, patients from his original 1950 study are still surviving, now in their 80's and 90's, and have lived their extended life spans by following Dr. Swank's guidelines. No processed foods containing saturated fat and/or hydrogenated oils. Saturated fat should not exceed 15 grams per day. Unsaturated fat (oils) should be kept to 20-50 grams/day. Fruits and vegetables are permissible in any amount. No red meat for the first year, including pork. After the first year, 3 oz. of red meat is allowed once per week. White-meat poultry (skinless) and white fish are permissible, but avoid dark-meat poultry and limit fatty fish to 50 grams (1.75 oz)/day. Dairy products must contain 1% or less butterfat unless otherwise noted. Use egg whites only, no yolks. Whole-grain breads, rice, and pastas are encouraged. Daily snacks of nuts & seeds are good sources of natural oil, and help maintain a good energy level. Multiple Sclerosis, (MS), is serious autoimmune disease, which can by profoundly influenced by following a specific diet. But which diet is best for MS? Geelong Nutritionist Adrian Stone from Living Holisitic Health explains more about this. Dr Terry Wahls, (pictured above), is a clinical professor of medicine at the University of Iowa Carver College of Medicine in Iowa City, Iowa, U.S.A. Dr Wahls has done lots clinical research and has published over 60 peer-reviewed scientific abstracts, posters, and papers. In addition to being a doctor, Dr Wahls is an MS sufferer. She was diagnosed with relapsing remitting multiple sclerosis in 2000. By 2003 she had transitioned to secondary progressive multiple sclerosis. She underwent chemotherapy in an attempt to slow the disease and began using a tilt-recline wheelchair, (pictured above), because of weakness in her back muscles. She says on her website, "It was clear: eventually I would become bedridden by my disease. I wanted to forestall that fate as long as possible." Dr Wahls began to search for answers to her MS beyond the standard drug treatments available. She continues, "Because of my academic medical training, I knew that research in animal models of disease is often 20 or 30 years ahead of clinical practice". This is an important point, as many medical practitioners confuse a lack of human trial "evidence", with no "evidence". As Dr Wahls found out, there is an abundant amount of evidence available on the importance of diet and certain nutrients in MS management. Dr Wahls has written several books, which are available for purchase on her website, detailing her diet and lifestyle plan on how she improved her health, one of which is pictured below. This dietary approach is modelled on the Paleo Diet, which is based on the hunter-gatherer lifestyle diets of our ancestors, prior to the dawn of agriculture. No grains/legumes, no dairy, no processed type foods. Meat, nuts and seeds, fruits and vegetables only. This differs from the Swank Diet in two main aspects; no restriction on fat content nor on meat content/composition. Overcoming Multiple Sclerosis (OMS) promotes a program of diet and lifestyle management that has been shown to improve the health and lives of people with MS. Professor George Jelinek, who was diagnosed with MS in 1999, developed the rigorously researched OMS Recovery Program. As a medical professional, (similar to Dr Wahls), Prof. Jelinek searched the medical literature for answers to assist his newly diagnosed MS, aside from just taking drugs. In his words, "What I found startled me. The literature is full of answers. It is clear that remaining well after a diagnosis of MS is more than just a possibility. With commitment to the right lifestyle changes, there is the real probability that many people with MS can live long, healthy lives relatively free of the usual problems associated with the illness." The OMS Recovery Program is based on the earlier work of Dr Swank. It emphasises the importance of diet, exercise, stress management, sunlight, vitamin D and omega-3 supplementation, and, when needed, medication. The benefits of following a ketogenic style diet for MS are based on new insights. It has been proposed that multiple sclerosis may not be just a purely autoimmune disease, it may also involve neurodegeneration. The duality of the inflammatory, (autoimmune), and neurodegenerative components is clear by the observation that MS can “worsen” at exactly the same rate regardless of whether a patient started off with decades of isolated inflammatory relapses or entered directly into progressive MS.
MS progression in the absence of immune attacks indicates a separate and parallel process to autoimmunity. The evidence that MS involves both neurodegeneration and neuroinflammation is ever increasing. And this has got to do with the importance of the power houses of your cellular health which we mentioned previously, your mitochondria. Mitochondrial dysfunction is thought to play a central role in the neurodegenerative disease process and a growing body of evidence suggests that mitochondrial dysfunction may also be of great importance in the pathogenesis of MS.
A ketogenic diet has a favourable effect on mitochondrial function. It reduces levels of reactive oxygen species, (which causes 'oxidation', which is similar to rust accumulating in your cells), and increases energy. 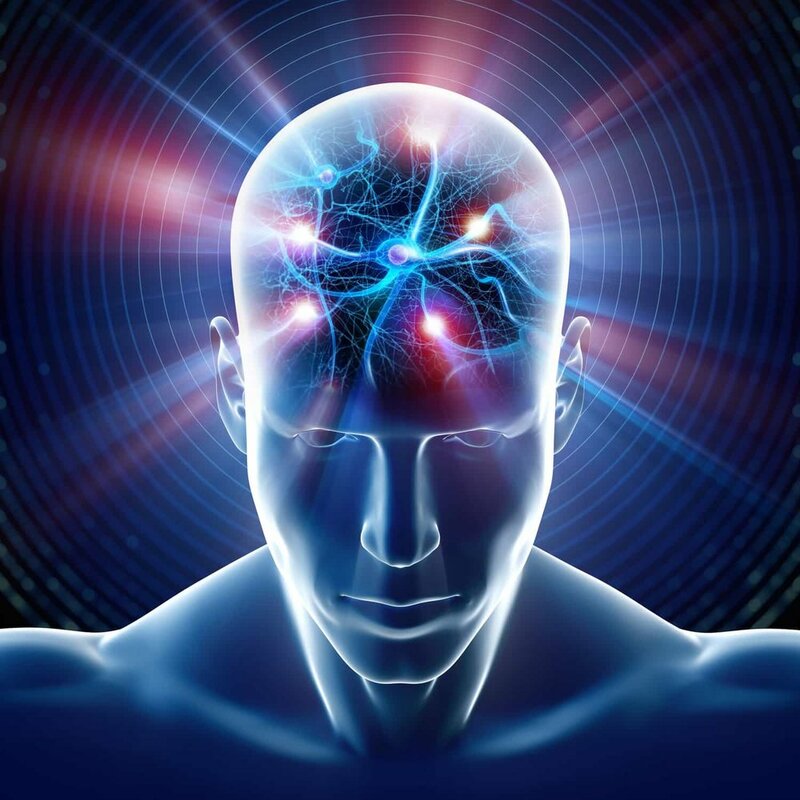 The diet may also provide neuroprotection and reduce inflammation. A ketogenic diet involves restricting the amount of carbohydrates in your diet, with adequate protein and high good fat content, so that the body burns fat for energy instead of carbs. This approach is then different from OMS & Swank in that it encourages more land based animals & fats, but not grains, which is similar to the Wahls Protocol. When you burn fat for energy, ketone bodies are produced, and can be measured in your urine. Your body is then in a state known as ketosis. When correctly monitored and controlled, this can be a safe and effective way to reduce inflammation in the body produced by MS. However, you do need professional advice and guidance before staring this diet, as there are risks associated with going too heavily into ketosis, a state known as ketoacidosis. But providing you have that professional support, the ketogenic diet may be the right one for you to help with your MS.
For some more reading on the relationship between your health, diet, nutrients and MS, please click on the links below. With guidance from us and these simple tips, you can become less inflamed – strengthening your body to become more resilient to the effects of multiple sclerosis.